How do you know if you need a chemical storage locker? There are laws and regulations from several government agencies at the federal, state, and local level, detailing chemical storage locker requirements. Agencies such as the Occupational Safety and Health Administration and the Environmental Protection Agency are determined for facilities to store their chemicals with safety and compliance. DO I NEED A CHEMICAL STORAGE LOCKER? If you intend to store chemicals within your facility, you need a chemical storage locker. But don’t worry; it doesn’t have to be a complicated process. U.S. Chemical Storage has the means to streamline your chemical storage locker buying process while providing you with unparalleled service and unequaled workmanship. A chemical storage locker is the best (and only) way to be sure you’re storing your chemical inventory with compliance; it is the only way to ensure your personnel, community, and environment are protected from chemical hazards. Chemical storage safety doesn’t just mean locking a door and posting signs. Your chemical storage locker should be capable of dealing with any unexpected event, be it harsh weather conditions, seismic activity, or accidental spills. You don’t want to wait until these events happen and realize you’re unprepared. You want to be prepared from the get-go, and ensure your family that the chemical hazards are lessened and that you’re protected. That’s where we come in. To help you in your endeavors, we offer several chemical storage locker options. Whatever your chemical storage needs, a U.S. Chemical Storage locker can be fully customized to help you achieve compliance. Our endless line of accessories is offered for all of our chemical storage buildings so you know your chemical storage locker is prepared to handle virtually any type of hazard, weather condition, or external factor that you may fear – best of all, with our 15 year structural warranty, you can rest assured for years to come. 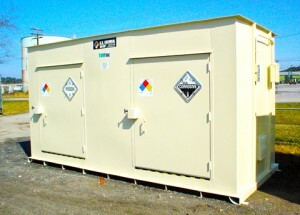 Hazmat Storage Buildings: Safe. Compliant.